I’ve always simultaneously loved and been really bad at sports. I became a distance runner after failing spectacularly at basketball, softball, and every other sport that required anything more complex than moving my legs quickly. Running and hiking have always been my athletic home, from racing with friends to traipsing solo through the mountains. A co-worker in New York was always raving about his CrossFit training, so when I moved to Somerville in 2013 I decided to see what it was all about. I was a little worried that getting into CrossFit would ruin my running because people say that “getting bulky” makes you slow (spoiler: it’s nonsense). 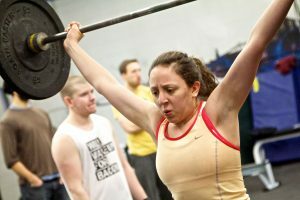 Still, I immediately liked the coaches and members at CrossFit Somerville and jumped right in. 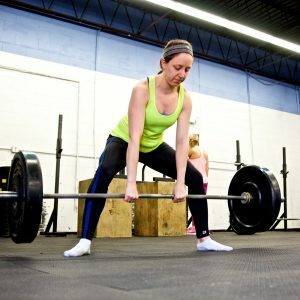 There was a definite learning curve and I was antsy — I wanted to understand the technical lifts and be able to do them right away, not spend time drilling movements while everyone else lifted heavy things. It took me a little while to understand that learning and perfecting skills here never stops, and that being continually in learning mode is actually awesome. 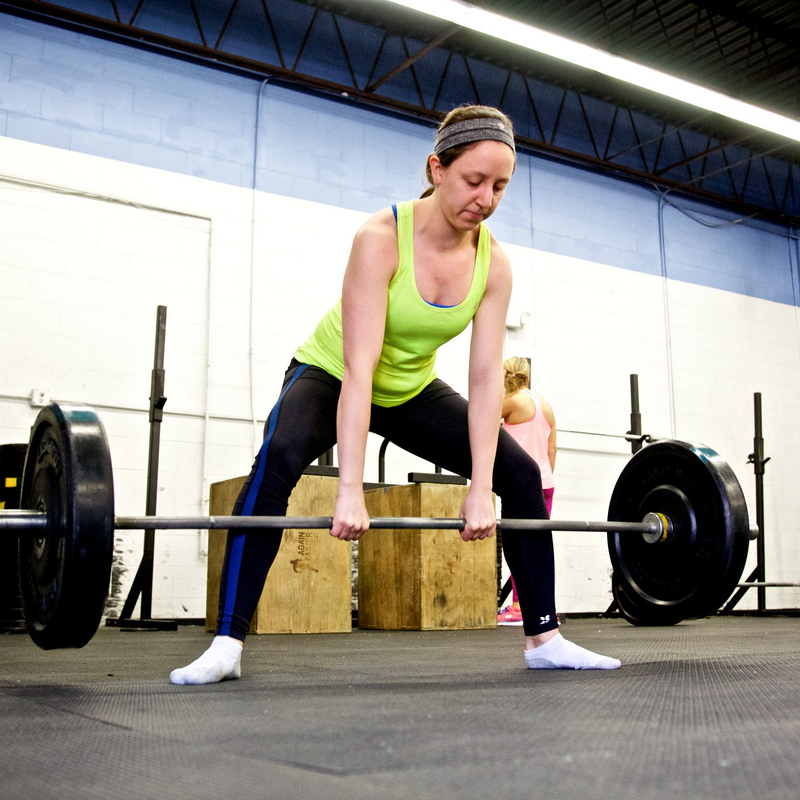 I was about two months into CrossFit when I was getting ready to run my first full marathon. Less than a week before the race, I came into the gym planning to take it easy. The WOD was 100 thrusters with 5 burpees EMOM (every minute on the minute). I picked what I thought was a reasonable weight for my barbell, but within minutes was completely jelly-legged. I switched to a lighter weight midway and still didn’t finish the workout within the 20-minute cap. I finished many, MANY minutes after everyone else, with KP and the class cheering me through the whole way. It’s the CFSV-effect that you don’t feel like an idiot when you finish last with everyone watching you, but instead feel like you did a surprisingly impressive thing. And even though I was still sore as anything five days later, that first marathon was pretty great. The more time I spent at CFSV, the more time I wanted to spend at CFSV. I started taking care of the backyard chickens and meeting up with friends to do workouts during Sunday open gym. I’ve seen myself not only get stronger, but also grow into a better understanding of how my body does and can potentially move. I find CrossFit and distance running to be very complementary and have met some of my best racing buddies at the gym. CrossFit has made me an all-around stronger athlete, so that I can jump into anything from stand-up paddle boarding in Brazil to bouldering at a local climbing gym to crawling my way through a Tough Mudder in Vermont (my 2016 highlight reel). JT and the coaches have created an incredible training culture that pushes us to move outside our comfort zones but also doesn’t take itself too seriously, which is probably why I’m the resident “dancer to bad 90s music” in the 6:30am class. There are days when my childhood stubbornness gets the better of me and I get frustrated for not doing as well as I think I could. 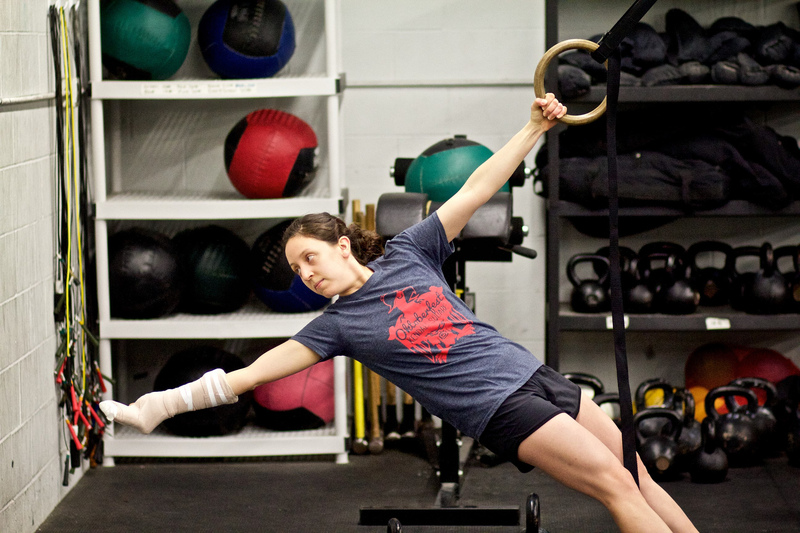 My worst months came after I was hit on my bicycle and wound up in a comically huge cast. Though the coaches did an awesome job of programming for what I could still do with one functional arm, not being able to run or lift was driving me half crazy. When I finally got my cast off I could barely move the fingers on my right hand and cried to JT after fumbling through a workout. My friends and coaches were my best support system as I worked through my hand and knee injuries, checking in and helping me get my strength back. After almost three years, CFSV is one of the main reasons I love living in Somerville. I’ve made many amazing friends here and continue to be challenged every time I walk through the garage door. And the best part: CFSV is around the corner from some bomb brunch places.